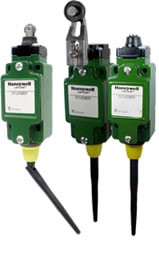 Honeywell Wireless Global Limit Switches, Greater Wireless Flexibility & Durability Honeywell’s Limitless™ wireless enabled sensors and switches combine time–proven MICRO SWITCH™ performance with the latest wireless technology. The Limitless™ Series Switches are highly flexible new performers that enable reliable remote monitoring where wiring is impractical or impossible. Combining this greater flexibility with proven harsh–duty packaging can result in increased efficiencies and improved safety for machines, equipment, OEMs and operators.